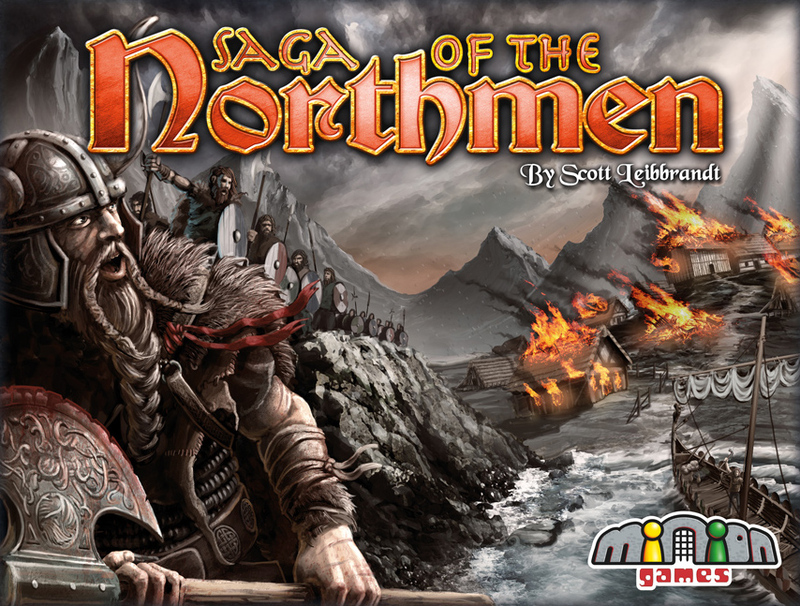 Saga of the Northmen is a game by Scott Leibbrandt, published by Minion Games. It is for 2-4 players. In this game, players take on the role of Northmen clan leaders during the Dark Ages. As leaders, they will be trying to gain control of the 7 major Kingdoms of Europe as they form trade routes and plunder the riches of these European Kingdoms. Of course their rivals can slow them down and even push them out of these Kingdoms through the use of their armies and fleets. In the end, the player that can gain the most wealth for their clan will be declared the winner. To begin, the board should be placed in the middle of the play area. Each player chooses a color and is given the influence cubes, hero tokens, time token and infamy card in their chosen color. The influence cards are shuffled and each player is randomly dealt 6 cards each. The remaining deck is placed facedown on the table. The top 3 cards of the deck are then placed in a row beside the deck. The trade route cards are shuffled and each player is randomly dealt 2 cards each. The remaining deck is placed facedown on the table. The plunder tokens are divided into 3 groups of 15 tokens each. Two sets of tokens are set aside for now. The remaining set is placed near the game board. The first player is chosen and is given the leader token. Players gain their starting infamy based on the number of players and their position in the turn rotation. Each player places a number of influence cubes equal to their starting infamy onto their infamy card. Play now begins. The game is played over 3 rounds. Each round is divided into 3 phases; rally phase, marching phase and planning phase. The first phase is the rally phase. In this phase, players will each take turns beginning with the first player. On a player’s turn, they will follow 5 steps. First, they will play an influence card from their hand face up in front of themself. If there’s already a card on the table, they will cover it with the new card so that the current card is the only one visible. Next, the player will place an influence cube for each symbol on the card that they just placed onto the matching kingdom. Once that’s done, the player has the option of paying 3 infamy points to add a hero token to the kingdom that they just added influence cubes to. Next, the player will place a plunder token on a neutral region that is shown on the bottom of the card that they played. If the last plunder token is taken from the group for the current round, the rally phase immediately ends. Finally, the player will draw an influence card from either the 3 face up cards or from the deck. Play then passes to the next player who follows the same steps. This continues, until like mentioned earlier, the last plunder token for the round is taken. The next phase is the marching phase. Before starting this phase, it’s recommended for players to place their hand of cards beneath their infamy card. This phase is divided into 7 steps. First, players determine who controls each kingdom by checking for majorities in each one. The player with the majority, leaves their pieces on the kingdom, while the remaining players must return their heroes to their supply and place their influence cubes onto their infamy card. These cubes now become infamy points and may be used immediately. Once each kingdom has been determined, players move their forces beginning with the Normans and continuing down the Kingdom chart on the board. Before moving any pieces, the player may choose to delay that kingdom’s movement by paying 5 infamy points, marking it with their time token. If the kingdom is delayed, play passes to the next kingdom. If the kingdom is not delayed, the player reveals the influence cards they played for that kingdom. For each soldier on the cards, the player is allowed to move 1 influence cube to a neutral kingdom adjacent to their kingdom. For each ship on the cards, the player is allowed to move 1 influence cube to any neutral region that’s adjacent to the sea. Hero tokens are moved as either soldiers or ships. Once a player has moved all their cubes out of a kingdom, the next kingdom on the chart is resolved in the same way. This continues until all 7 kingdoms have been resolved. Once this is finished, any kingdoms that were delayed will now perform their movements by following the same rules, beginning once again with the Normans and continuing down the chart. Next, any kingdom that contains pieces from more than 1 player must battle. The winner is the player with the most pieces in the region. The loser must return any heroes to their supply, while influence cubes become infamy points and are placed on the player’s infamy card. These points are available for use immediately. After any and all battles are resolved, players collect plunder tokens from the neutral regions that they control. Next, players are allowed to play trade route cards if they’re able to complete the route. To do this, the player must control the kingdom at the top of the card and have cubes in the neutral region at the bottom of the card. The player then places the completed trade route card in front of themself. Once this is completed, players remove their pieces from the neutral regions as well as any used time token, returning them to their supply. The last phase is the planning phase. Beginning with the first player and continuing in player order, each player will take a turn. On a player’s turn, they will take one or both of the following actions; draw trade routes and/or hold influence. To draw trade routes, the player may spend 3 infamy points to draw 2 new trade route cards, choosing 1 to keep. The other card is returned to the bottom of the deck. To hold influence, the player may spend any number of infamy points to save influence cards already in their hand. They are allowed to keep 1 card for each point that they spend. Any influence cards that are not saved in this way, must be discarded. Once players have completed their planning turn, the influence deck and 3 face up cards are removed from the table. These cards along with any influence cards that were discarded are shuffled together to form a new deck. Each player is then dealt cards until they each have 6 cards in their hand. The deck is then placed face down on the table and the top 3 cards are placed face up in a row beside it. The next set of 15 plunder tokens are then moved next to the board to start the next round. The leader token is passed to the next player in turn order and a new round starts. Once the third round has been completed, the game is over. Players will then compare their infamy points. The player with the most will receive bonus plunder equal to 1+ the number of trade routes they completed during the game. Player will then add up their points from their plunder tokens, completed trade routes and bonus plunder they may have received. Players will then compare scores and the one with the most points is the winner. This game looks really great. The board is a lovely picture of Europe with some nice details and colors on it. The influence cubes and plunder tokens are all brightly colored wood and are really sturdy. The hero tokens, time tokens and leader token are all cardboard. Each of these has some great looking artwork, especially the hero tokens. Each of these is unique and has a thematic looking hero on them . The cards for the game are outstanding. The influence cards are thematically great. I love the different ships and soldiers designs on them. The artwork looks great. The infamy cards are also nice and detail the different abilities and costs for each one on it. 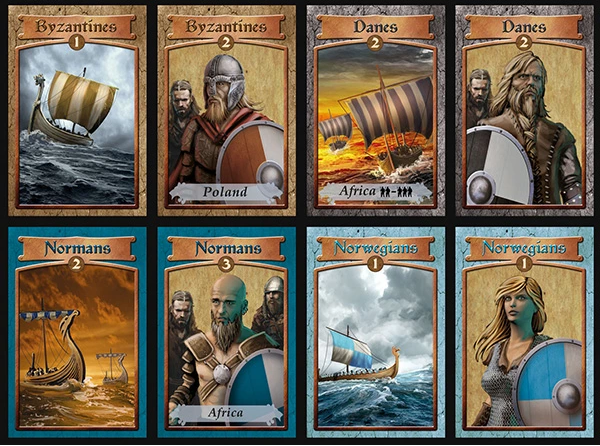 The trade route cards show off the same style look and art as the board. These are also quite nice as well. Overall I’m quite pleased with the look and feel of the game. It has several thematic elements to it that help get you involved in the game. I like it a lot. The rulebook for this one is great. It has plenty of pictures and examples throughout the book. Each of the different playing pieces are explained in great detail. The rules are covered in great detail as well and are easy to read and understand. There’s nothing in the book that I found difficult or unable to figure out. It’s all pretty straight forward. It doesn’t take a long time to read over either, which I liked. Overall I’m very pleased with the look and feel of the rulebook. It’s quite nice. I’ll be honest. When I first looked at this game I was thinking, “Is this a war game? I’m probably not going to like this game.” Happily, it’s not and I do. Like it, that is. Basically, in the most simple of terms the game is all about area control. Each round you will try to work out the turn order into your favor so that you can best control certain kingdoms. Once you have your marching orders, you’ll move your armies and fleets around to try to gain some lucrative plunder. There will be times when you’ll want to use your time token to delay your action to get a better idea of what your opponents are doing. However, you’ll have to be aware that they can do the same thing to you, making this a two edged sword. The good part is that even if you lose a kingdom or region, you’ve at least got some infamy points as a consolation prize to help you out later. Once you’ve got all that figured out, it’s time to use those infamy points and draw new cards and choose which ones you want to keep. This will help protect about the one weak point that I found in the game, the luck of the draw. You can’t really protect yourself completely from it. The only thing you can do is save whatever good cards you have, if you’re able, and hope for the best. I will say that I understand the comparison that this game gets to Ticket to Ride. The trade route portion of the game does have a mild similarity, but only mildly. Overall, I think the game works and is quite a lot of fun. Fans of area control games will enjoy the smooth streamlined mechanics of this one. It’s definitely a game that I would recommend. Saga of the Northmen is a fun and streamlined area control game. It’s not a long game to play. Most game sessions last around 30 minutes or so. The artwork on both the board and cards is great and very thematic. I love the look and feel of these aspects. The game itself is a lot of fun and is smooth and fairly easy to play. Even though it’s not difficult to teach, there’s still a good bit of strategy to the game. This should make strategy players happy. The luck of the draw does factor into the gameplay but can be mitigated through the use of infamy points. The trade routes have some similarities to those in Ticket to Ride, but only slightly. Fans of area control games should enjoy this one a good bit. It’s definitely a game that I recommend. I really enjoyed it and think you will to. Now prepare the fleet, it’s time to sail. For more information about this and other great games, please check out Minion Games at their site. This entry was posted in Reviews and tagged board, board games, card, card games, games, liebbrandt, minion, minion games, northmen, saga, saga of the northmen, scott, Scott Leibbrandt. Bookmark the permalink.